Sometimes it’s enough the way the Bulls play defense with ferocity, passion and zeal. But against the better teams, and especially ones who can match the Bulls’ effort, the absence of Derrick Rose is most noticeable. It was Monday as the Bulls lost a rugged, relentless defensive game to the Memphis Grizzlies, 80-71, because the Bulls really don’t have an offensive player who can carry a team for at least one major stretch. That’s been Rose’s role for four years. And perhaps he could have saved them and turned a blue Monday brighter. Perhaps he will on some future Monday. But for now the Bulls usually are going to lose these kinds of games, though not always like this with a four-year low in scoring. The Bulls have a nice ensemble cast. They make it difficult on opponents, and many of them crack. It’s no fun to play the Bulls, who are chasing and contesting and bumping. The Bulls did all of that well against the Grizzlies. “I thought our defense was pretty good,” said Joakim Noah, who had 11 points and nine rebounds. The Bulls and Grizzlies entered the game tied for second in fewest points allowed. The Bulls were tied for second in opponents’ shooting with the Grizzlies sixth. I also thought the Bulls defense was very good. It held the Grizzlies to 37.5 percent shooting. The Bulls held the Grizzlies to a season low 11 points in the first quarter as the Bulls led 20-11. The Bulls are the league leader in holding opponents to the fewest assists, meaning they force opponents into bad shots and isolation situations with their help more than anyone. The Grizzlies recorded just 16 assists. The Bulls harassed the Grizzlies two scoring stars, Zach Randolph and Rudy Gay, into nine of 27 shooting. As disappointed as a terse Bulls coach Tom Thibodeau was in his post game remarks, it was a game the Bulls played as hard as any this season. But with one of the top perimeter defenders in the league, Tony Allen, chasing and denying Marco Belinelli, with the athletic Gay shadowing and bumping Luol Deng whereever he went, with Randolph and Marc Gasol denying Noah the inside and forcing him outside to pass and shoot the Bulls simply could not find enough offense to compete. 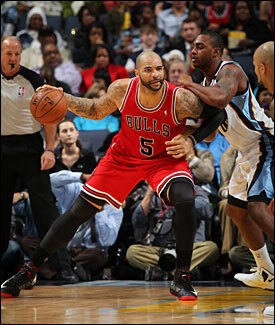 Carlos Boozer had a team high 16 points and 13 rebounds. But he seemed to tire with missing a pair of tips in the third, throwing the ball away and failing to come up with a loose ball. Thibodeau only played him in the fourth quarter when Noah got a fifth foul. Belinelli and Deng were a combined eight of 29, and this Bulls group cannot overcome that sort of offensive frailty, even with its impressive defensive play. “When you look at a game like this here, 37 percent shooting by both teams, I don’t know how it looks to the fans but to me as a coach it’s just a good basketball game, a hard fought basketball game by two good teams,” said Grizzlies coach Lionel Hollins in summing up the game well. “We got the rebounding 51-39 and we had 18 offensive rebounds. We didn’t give up a bunch of points on turnovers. There were not a lot of fast breaks. Even when we got second chance points, there weren’t a lot of second chance points. We got rebounds but we weren’t scoring. They got rebounds but weren’t scoring. It was a tough one and I’m just happy our second unit really sparked us and got us ahead and we played with the lead down the stretch. It was a good, tough game considering the feeble offenses of both teams. In a sense, the Grizzlies won it, though the Bulls were within five with five minutes left, in a second quarter surge when designated shooter Wayne Ellington came in and made four straight jumpers, three of them three pointers. The blues in Memphis never sounded sadder for Chicago. Thibodeau, of course, was disappointed of the Bulls’ failure to run players off the three point line. The Bulls had been holding three point shooting to 29 percent the last 11 games, but the Grizzlies were eight of 11 from three. That second quarter run enabled the Grizzlies to turn a 20-11 deficit to start the second into a 31-28 lead. Although the Bulls stayed close throughout the third quarter and late in the fourth, they never led again. Ellington was Belinelli’s responsibility during that sequence, though Memphis did a good job squeezing and cutting off Belinelli with screens, and the Bulls help never got there. Belinelli did score 13 points for his seventh straight double figure scoring game with Richard Hamilton still out. But it was the third consecutive game the Bulls were outrebounded, which perhaps was a sign of fatigue. Thibodeau talked mostly about defensive mistakes, and there were if the goal was perfection. It may be, though it remains out of any reasonable reach. True, the Bulls offense didn’t function particularly well as Kirk Hinrich returned from missing two games and admitted he wasn’t quite right yet. The Bulls fell to 13-10 with their ninth loss in the last 11 in Memphis and face Boston in the United Center Tuesday. The Grizzlies are 16-6 and 10-2 at home. The Bulls did as good a job on their front court big three of Zach Randolph, Marc Gasol and Rudy Gay as any team I’ve seen this season. The three were a combined 10 of 34. The Bulls made nothing easy, but when matched with similar aggressive play the Bulls encountered trouble finding enough scores. Yes, as Thibodeau said, they didn’t rotate the ball enough. And they couldn’t maximize fast break opportunities, though they tend to play half court. They trapped some, but failed to get much in transition. Though somewhat sloppy to start, the Bulls were a bit less careless that Memphis. They’re sort of reinventing the Eddy Curry role for Boozer with early scoring and then defensive replacements late. Boozer led the team with eight first quarter points, including a running dunk to open the game and a strong move at Randolph. Randolph did finish with 15 rebounds, but just 10 points as Mike Conley led Memphis with 17. Uncharacteristically, the Bulls gave up 18 offensive rebounds, the only real weakness in the defense in being unable to clean up their defensive boards after making those stops. Still, the Bulls had the Grizzlies flummoxed until that second quarter run by their reserves. It was a 28-14 Grizzlies second quarter led by the Memphis bench that gave them a 39-34 halftime lead. Overall, the Bulls reserves were outscored 31-16, though they played about half as many minutes as the Memphis reserves. The Bulls had some nice moments in the second quarter, Boozer with a pair of scores, the second as he scooped up a loose ball, Noah with a perfect back door pass to Deng for a score and Taj Gibson going up in traffic to get a rebound and dunk follow. But they were too few. Gay began to find the basket some to open the third while Noah matched him with three jumpers. Noah was about to perform his pantomime pistols routine again after making shots, but with the recent Connecticut school shooting he apparently has decided it’s not an appropriate reaction. That is a sensitive subject. I’ve had some fans write me asking Noah to stop as a promotion of guns. I never felt it was my business to tell him, but I am pleased he said he’s giving it up. Noah tends to have difficulty with big, physical front courts like the Grizzlies’ and the Clippers, and thus didn’t get to the basket as much. Plus, Gasol plays well off Noah, daring him to shoot, which also clogged the lane and made it more difficult for Bulls’ penetration. That’s where Thibodeau emphasized that cross court movement which the Bulls didn’t pursue as much. It was still Memphis by three late in the third when Randolph finally got deep position and scored and Conley added a three to a couple of nice, running tear drop shots we’ve seen from Rose. That gave Memphis a 61-53 edge heading into the fourth quarter. The Bulls tried trapping early in the fourth to push themselves into transition, but they couldn’t rattle Conley. The Bulls were within 68-63 midway through the fourth on a pair of Jimmy Butler scores. But the Grizzlies continued to swarm Deng. Randolph and Gay scored on second chance opportunities, and the Bulls just didn’t have enough places to go for someone to make an offensive play. The Grizzlies then closed it out with free throws as the Bulls failed to score 20 points in a quarter after the first. Which is pretty much the difference in seriously competing and where the Bulls are now, about having an MVP player in the lineup and waiting for one to return.